For other national defense universities which use the British spelling, see National Defence University (disambiguation). 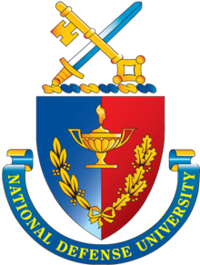 The National Defense University (NDU) is an institution of higher education funded by the United States Department of Defense, intended to facilitate high-level training, education, and the development of national security strategy. It is chartered by the Joint Chiefs of Staff, with Major General Gregg F. Martin as president. It is located on the grounds of Fort Lesley McNair in Washington, D.C. The university's mission is to prepare military and civilian leaders from the United States and other countries to better address national and international security challenges through multidisciplinary educational programs, research, professional exchanges and outreach. The school's master's program is a one-year intensive study program. Most students are officers and selected civilians in Washington. Students take classes in advanced strategic methods and diplomacy. Several institutes serve the university in developing policies of the government, while also creating simulations and war games to help keep the military current with specific concerns. To better integrate all the learning of the programs, Congress created the National Defense University in 1976. In 1981, the Joint Forces Staff College was created, followed by the Information Resources Management College the next year. In 1984 the university created the Institute for National Strategic Studies to meet the demand for military research. Throughout the 1990s and early 2000s, NDU has primarily expanded its research centers, to develop better strategy and a more comprehensive education program. After the Goldwater-Nichols Act and the House Armed Services Committee Skelton Panel Report, the University decided to seek authority to grant master's degrees. In 1993 President Bill Clinton signed into law a bill that allowed NDU to grant the degree of Master of Science in National Resource Strategy upon graduates of the Industrial College, and the Master of Science in National Security Strategy upon graduates of the National War College. The university is accredited by the Middle States Association of Colleges and Schools. It also includes a number of special programs including Capstone, Pinnacle, Keystone, the Joint Reserve Affairs Center, the NATO Staff Officer Orientation Course, the International Student Management Office, the Secretary of Defense Corporate Fellows Program, the National Security Education Program, the Interagency Transformation Program, and the Center for Strategic Communications. It is located in Roosevelt Hall in Fort Lesley J. McNair, Washington, D.C. It was officially established on July 1, 1946, as an upgraded replacement for the Army-Navy Staff College, which operated from June 1943 to July 1946. The College of International Security Affairs (CISA) is NDU’s focal point for interagency and international security education, promoting a common understanding among agencies, nations, and military services. The College presents qualified students with a Master of Arts (M.A.) Degree in Strategic Security Studies and is considered one of the preeminent counterterrorism and security studies programs in the world. In addition to completing a rigorous academic curriculum, students must conduct research throughout the year on a security topic and present their findings in the form of a thesis paper that is turned in at the end of the program. Throughout the program, students are given direct access to some of the United States' top security practitioners at the Department of Defense, the Department of Homeland Security, and the Department of Justice. Four areas of concentrations are currently available within the master's program: Counterterrorism, Conflict Management of Stability Operations, Homeland Security and Defense, and International Security Studies. The College is home to NDU’s International Counterterrorism Fellowship Program. The ICTF program is the flagship of the Department of Defense's Regional Defense Combating Terrorism Fellowship (RDCTF) program—which brings roughly 50 counterterrorism specialists to the College each year from coalition partner countries. INSS is the primary research institution of National Defense University and is led by the University's Vice President for Research and Applied Learning. Its fellows conduct research regarding national security policy and design and conduct strategic gaming exercises. Because its goals for United States strategy aim for minimal conflict, the staff frequently hosts and visits the military research institutes of other nations, most importantly those of the People's Republic of China, the Republic of China, Japan, and the Russian Federation. The meetings are meant to foster collaboration and understanding. To provide a forum discussion and feedback on joint force matters as well as offering a forum for the research NDU conductes, NDU Press publishes Joint Force Quarterly, a magazine that covers the specific issues related to national security and military strategy and PRISM in conjunction with the Center for Complex Operations. Similarly, since the institute's establishment in 1984, the fellows have published hundreds of scholarly papers under the NDU Press imprint as well as other specialized journals and fellows frequently publish in the op-ed section of many papers. NDU, as part of its mission offers several course programs for further education to selected officers and NCOs. Capstone, Office of Reserve Affairs (ORA), College of International Security Affairs (CISA), International Student Management Office (ISMO), National Security Education Program (NSEP), Center for Technology and National Security Policy (CTNSP), Secretary of Defense Corporate Fellows Program (SDCFP), and the NATO Staff Officer Orientation Course (NSOOC). ↑ Jeffrey McCausland, Educating Leaders in an Age of Uncertainty: The Future of Military War Colleges. Carlisle, PA: Dickinson College, 2005, p.266.